Dine at Sydney’s restaurant-of-the-minute to see if its food and wine matches the drama of its inspired aesthetic. Everyone in Sydney is waxing lyrical about Restaurant Hubert. For months it seemed to be the only restaurant any one was going to. It even compelled seasoned restaurant critic Terry Durack to uncharacteristically employ all-caps as he proclaimed his love for the place in what I can only imagine was a post-chicken fricassée fervour. Sydney’s Restaurant Hubert evokes the character of a 1940s cabaret venue (photo: Keith Webb). This all makes me nervous given Sydney’s proclivity to jump on the restaurant-of-the-minute bandwagon, only to defect once the next highly publicised venue is unveiled. Yet already Restaurant Hubert has received two hats and the Best New Restaurant title in the Sydney Morning Herald 2017 Good Food Guide awards. 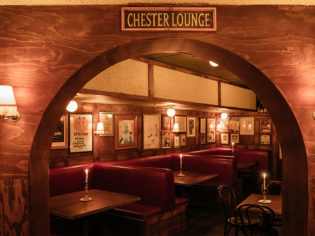 It also comes with pedigree, being the latest venue from the Swillhouse Group – of The Baxter Inn, Shady Pines Saloon and Frankie’s Pizza – who craft their spaces more like theatre sets before inviting patrons in to act out the scenes. The stage is set the moment you enter from Bligh Street. Once you pass into the amber-lit, wood-panelled stairwell lined with miniature liqueurs (a lot of eBay hours right there!) that curves seductively down to the basement, you assume character. The brief here was post-war France with a side of charming old world hospitality, and it could not be executed more elegantly. I immediately regret not wearing red lipstick and pearls. Nonetheless, by the time I reach the base of the stairs and the cavernous restaurant is revealed, I feel glamorous by association. You can truly dislocate from the outside world in this carefully curated alternate reality. Restaurant Hubert is immersive but the real marvel is that it’s not contrived. From the fringed table lamps, dark wood furniture, long, well-stocked bar, crimson drapes, and grand piano, it simply looks as though it’s always been here. All that, however, is meaningless if the food and wine don’t match the same deft touch of the interiors. Dan Pepperell, (formerly 10 William St in Paddington), is charged with making sure the illusion of a late 1940s Parisian bistro is absolute. Because my dining partner has, like the rest of Sydney, already eaten here, we forgo the all-caps-inspiring chicken fricassée and choose smaller dishes to share in a romantic booth for two. First up the duck rillette is a soft, creamy treat adorned with cute duck-shaped crispbread. Next the vinegary smack of pickled octopus offers a foil to the rich rillette and comes with two texturally perfect kipflers. We move on to a bistro classic, the prime beef tartare made from wagyu and served with skinny fries. I’d heard the tartare tastes like a Big Mac, which could be a bad thing… it’s not. There’s definitely a nostalgic familiarity in the flavour thanks to the condiments and high fat content, but in terms of quality there is no comparison. The velvety tartare melts on the tongue and, I’d wager, melts a few hearts, too. We finish with quenelle de poisson sauce Nantua, or the less-glam-sounding fish mousse with lobster cream and yabby. We split the yabby King-Solomon-style but without claw crackers, I feel we miss some of the best bits. The mousse is more of a silky, gorgeously blistered custard and paired with the deeply crustacean-hued lobster cream it tips us over the edge. Pepperell and his kitchen team are clearly playing the long game to ensure Hubert remains a classic. My menu selection, however, could be improved. You do need to watch the richness of the dishes especially when enjoying with a bottle of red. Next time, I’ll sub in a lighter dish to keep the balance. And, of course, there will be another time, because, like the rest of Sydney, I, too, LOVE THIS PLACE. Believe the hype; it’s everything you want it to be. How equal thought has been given to both the ambience and food; you can really lose yourself in another time and place here. Definitely keep some tables available for walk-ins, but a no-bookings policy (for less than six) is unfair for those coming from farther afield, as they risk not getting a table or having to kill hours in the city waiting for one.